There was a time when the local church spire was the tallest point in most towns. They were impressive sights and could be seen from miles around. If you climbed to the top of a spire, you literally were at the top. Today, I want to share four other spires that can take you to the top of your field of endeavour. Aspire – If you want to achieve great deeds, you have to aspire first. Be specific about what you want, set big goals, dream big dreams and have the inner belief that you can deliver remarkable results. Conspire – It’s great to have a goal, but you also need to find a way to get there. Plan, scheme, innovate and develop ideas that will take you closer to your goal. Give yourself clear actions that you can take and ensure that you have a timeline for your plan. Perspire – OK, so you have bold aspirations and a plan, but you have to be willing to back them up with solid, old-fashioned hard work. Put in the hours, train hard to develop your skills and never stop looking for opportunities to outwork your competition. Inspire – In the words of John Maxwell, “If it’s lonely at the top, you’re doing it wrong.” Don’t fall for the trap of thinking that success is all about you, but make sure that you are taking others on the journey with you. Find people to coach, mentor, encourage and inspire and you will multiply your impact through others. 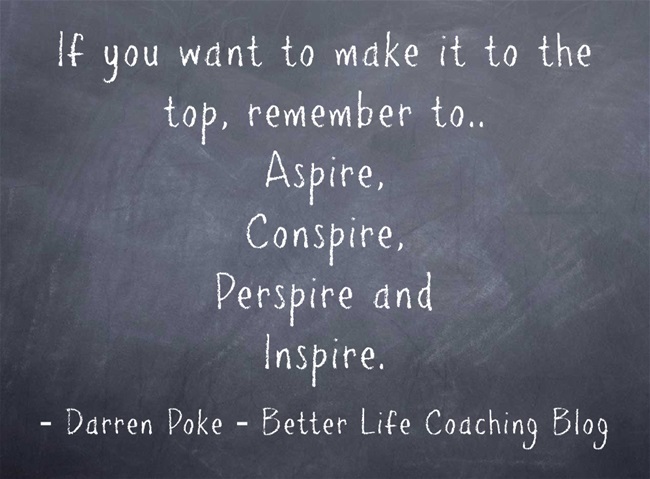 They are simple principles, but they work, so if you want to make it to the top, remember to aspire, conspire, perspire and inspire. Next post – Do You Ever Get the Feeling That Someone Is Watching You? Very nice post sir..Thank u so much 4 sharing.